When Ryan told me that this fabulous Chocolate Lasagna ranks up there on his list of favorite desserts of all time, I knew I had to share it with you. Just looking at the layers upon layers of goodness, you can tell it’s going to be worth salivating over! You will begin with the crust which consists of crushed Oreos mixed with a little butter. You will want to use regular Oreos versus the Double Stuff variety and you’ll need all 36 cookies that come in a typical package of Oreos (minus the 1 or 2 or 3 that you are obligated to sample before crushing them…). After pressing the cookie/butter mixture into a 9 x 13 inch baking pan, you’ll get working on the layers! What I love about this recipe is that the layers are actually quite light. Maybe not in calories, but this dessert will NOT sit in your stomach like a brick like some desserts! The first layer is a white layer which consists of cream cheese that you’ve whipped until fluffy, sugar, a little milk, and some Cool Whip. Not whipped cream, Cool Whip! 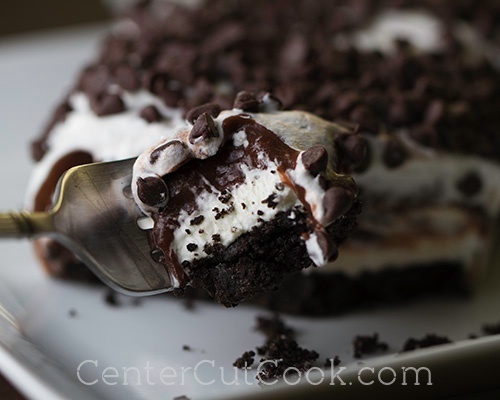 Once that’s spread over the chocolate-y Oreo crust, you’ll prep the chocolate layer! The chocolate layer is simply chocolate pudding. Seriously, how easy is that? You will need two boxes of chocolate instant pudding. Make sure it’s instant pudding guys, and not the cook and serve variety. I didn’t realize that I had bought the cook and serve kind, so I sat there whisking and whisking…. and whisking the mixture waiting for it to thicken up and it never did. Then I realized what I had done and had to make an emergency trip to the grocery store to buy instant pudding! At any rate, once the pudding has thickened up a bit, you’ll spread it over the white layer. Yum yum. At this point, let it rest for about five minutes before continuing on to the next step. The very last layer is simply a little more Cool Whip that you’ll spread over the top. Because this is Chocolate Lasagna, I figured I’d throw in just a bit more chocolate to complete the experience of Chocolate Lasagna, so I sprinkled a bunch of mini chocolate chips on top. It was the perfect addition! 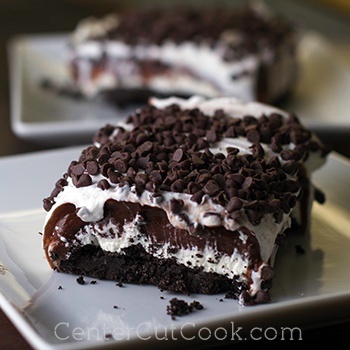 If you’re familiar with the Chocolate Lasagna that Olive Garden serves (served? I hear they no longer sell it), this is nothing like it. 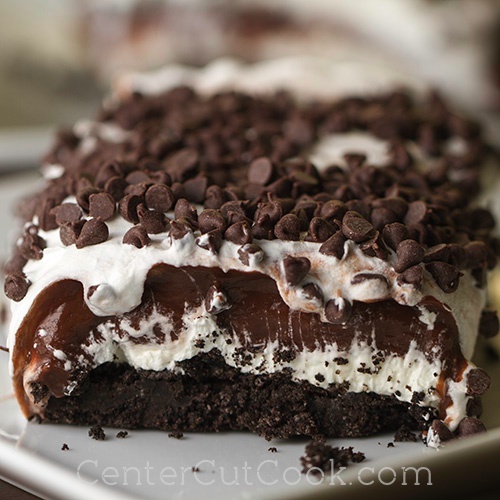 Their layers were more cake-like while this Chocolate Lasagna is just light and fluffy layers of pudding, and Cool Whip with a little cream cheese mixed in. We really loved this Chocolate Lasagna. Each layer complimented the next just perfectly! And, it makes a big 9 x 13 inch pan so that you will have plenty for sharing. 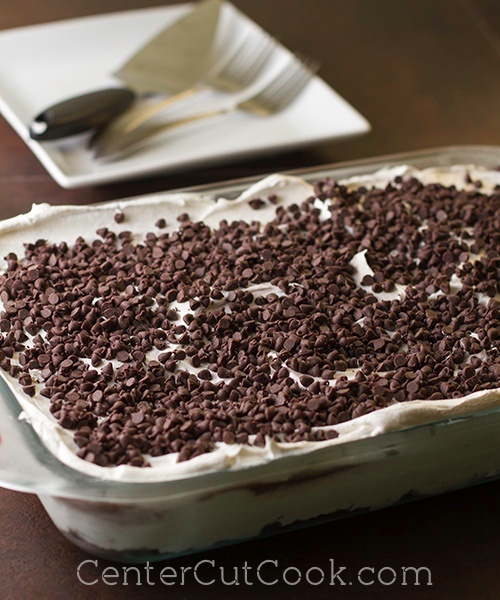 Oh, and did I mention that it’s a no-bake treat? I love it when I come across a fantastic treat that requires no oven! Enjoy!